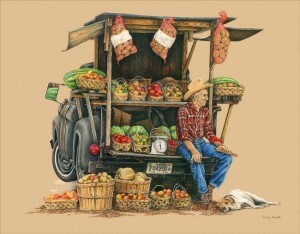 Back at the market this weekend… sweet corn and home grown tomatoes… a few heirlooms, red and yellow. Kenny has some canning tomatoes available if you need any for your home canning this year. Beets, cucumbers, kale, Swiss chard, zucchini – green & golden, cabbage, yellow squash, green peppers, green beans, egg plant and new potatoes. Kenny will be bringing plenty more candy onions and a wide variety of peppers. Also available on Saturday fresh celery, parsley, basil, mint and cockscomb flowers. Peaches are just about perfect, be sure and get your orders in early. Watermelons are ripe and tasty, we should have a few more this weekend. We now offer our “Baskets of the Week” every Saturday. If you are in need or want one please email me by noon Friday, val@russellveggies.com. The prices will remain the same as last year…$16 for the small ones and $32 for the half bushel size. It takes lots of planning to make these happen, they are done fresh Saturday morning and are pre-order only. We will have more of our homemade jams and jellies along with Kenny’s Grilling Planks and Blackening Spice. I will also have a few fairy wands available. Just a reminder that we have been selling out early… Don’t forget to pick up your farm-fresh, free-range eggs while available.